To develop an empirical formula I used an Unihedron "Sky Quality Meter - L" to measure the brightness of the night sky in SQM units mag/arcsec2 as function of the Sun elevation at one night. 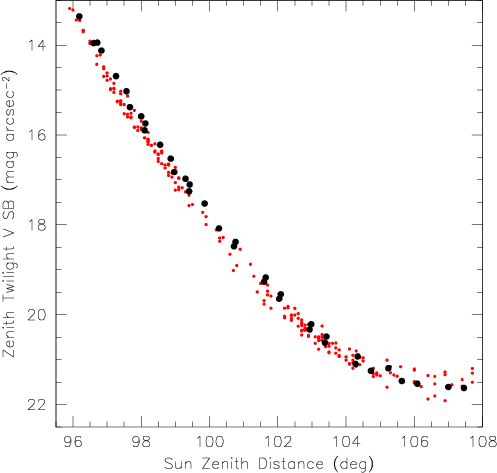 Civil twilight – when the Sun is below the horizon, but the Sun's centre is less then 6° below the true horizon. Nautical twilight – when the Sun's centre is between 6° and 12° below the horizon. For nautical purposes sailors can distinguish a visible horizon for reference. Astronomical twilight – when the Sun's centre is between 12° and 18° below the horizon. Below that the sky is truly dark and no remnant of the Sun's afterglow can be seen. For twilight the elevation is defined the angle of the geometric center of the Sun with the true horizon. Note that the apparent horizon is about 34 arc minutes lower. Note also that Sunset is defined if the upper limb of the sun is below the apparent horizon. The Sun elevation is for these reason sometimes expressed in distance from the zenith. The maximum darkness the sky can reach is a SQM value of around 21.75 to 22 mag/arcsec2due to the natural sky background brightness. The natural sky brightness is caused by the zodiacal light, stars, Milky Way and Gegenschein.. In Johnson U (blue) it is higher and R (red, and I (infrared) it is lower. 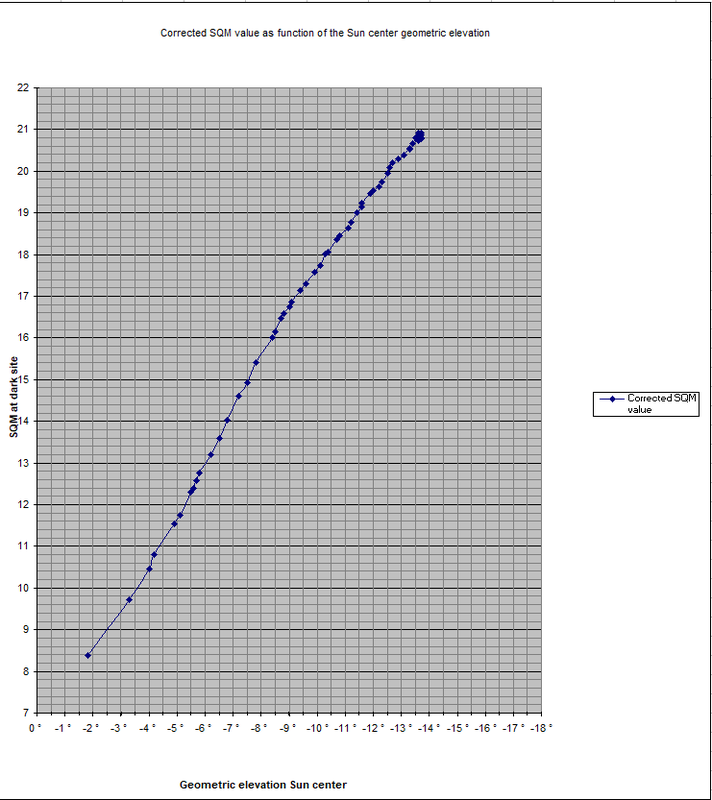 The best site SQM value of the site in the past where about 20.7 mag/arcsec2 equal a sky brightness of 0,00057 cd/m2. The natural brightness without light pollution (literature) is assumed to be 21.75 mag/arcsec2 equals 0,00022 cd/m2. 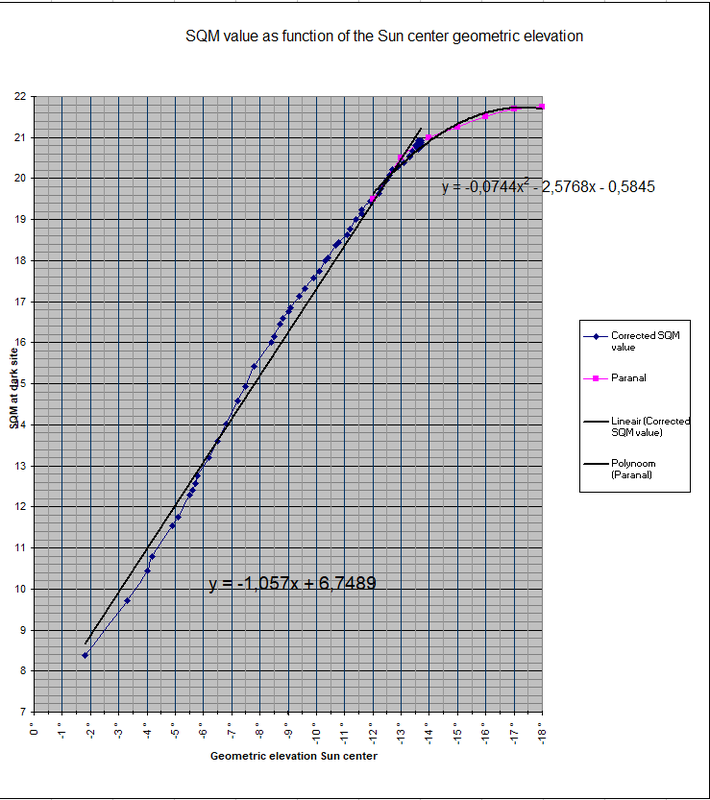 So the measured values where first converted to a linear range in cd/m2 , then corrected with - (0,00057 - 0,00022) cd/m2 and then converted back to the SQM logaritmic range in mag/arcsec2.. 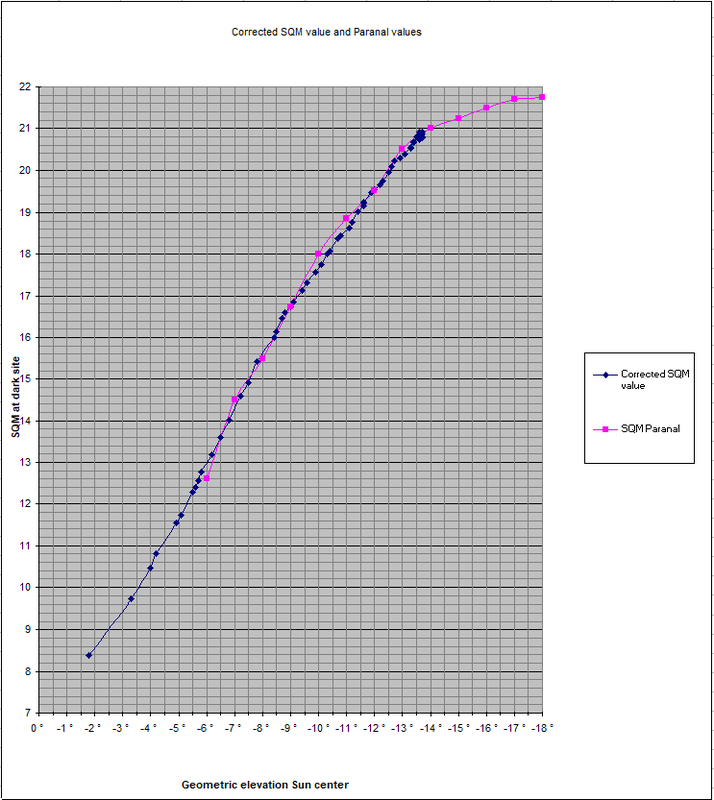 Comparison between the zenith twilight-sky brightness measured at Paranal (small symbols) and the Crimean Astrophysical Observatory (large symbols) for the V passband. The measurements are depending on many factors such as air transparancy so are an indication only. More measurments are required to get a higher accuracy. Back to the HNSKY index page.